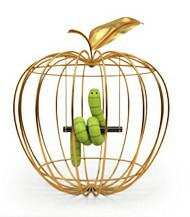 Mobile Raptor: Apple stops claiming Mac is virus proof - It is high time you get some protection. Apple stops claiming Mac is virus proof - It is high time you get some protection. "Apple quietly quits claiming that its Mac OS X is virus proof" reports GSM Arena. The change regards the marketing messages on Apple’s website, which highlight the qualities of the Mac operating system. The overly confident “It doesn’t get PC viruses” statement has been replaced by a rather more humble “It is built to be safe”. Also, the “Safeguard your data. By doing nothing” slogan has been replace with “Safety. Built in.” You can check out the difference between the two descriptions in the image below. I think it is high time that you get some Anti-Virus protection on your Mac, if you still have not gotten one. Just a few months ago, 670,000 computers were affected by malware, 98% of them running Apple's Mac OSX. Sophos Anti-Virus for Mac Home Edition has been installed on my MacBook Air for eighteen months now. It quietly works in the background, so I do not even know that it is there. Given how much Sophos' enterprise oriented anti-virus costs, I am pretty amazed they have a Mac OSX version for free. Another free solution is Avast Ant-Virus for Mac. I have not tried Avast's Mac OSX software. I am very happy with the Sophos' offering and really so no reason to switch. If you try the avast! Free Anti-Virus for Mac, feedback would really be appreciated. Two free apps by well regarded companies. I really do not see any reason why you should not run one of this two security suites. You said that over 500 thousand PCs has been infected over the past few months. You didn't mention if Mac PCs were amongst them and how much of Mac PCs have been infected. Sorry, post a bit vague. Updated it - "670,000 computers were affected by malware, 98% of them running Apple's Mac OSX."